A spacequake in action. 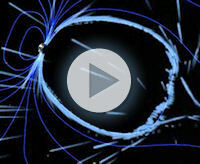 Click to launch a computer-simulated movie created by Walt Feimer of Goddard's Scientific Visualization Lab. 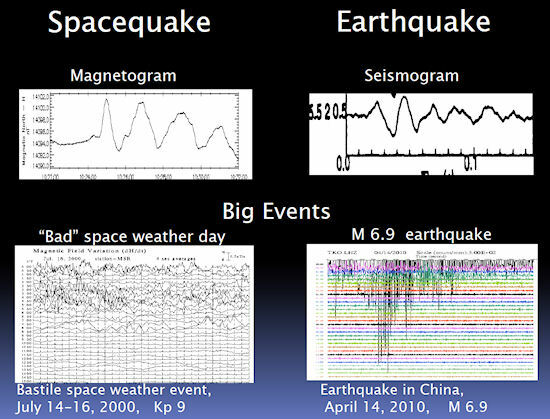 During a spacequake, Earth's magnetic field shakes in a way that is analogous to the shaking of the ground during an earthquake. Image credit: Evgeny Panov, Space Research Institute of Austria. A THEMIS map of plasma flows during a spacequake. The axes are labeled in Earth radii, so each swirl is about the size of Earth.